Americans have begun snapping up Toyota Prius, Honda Fit and other fuel-efficient models made only in Japan almost the way shoppers denude bread and milk shelves in a supermarket when a storm is predicted. The intensity first spurred by rising gas prices has been amplified by predicted shortages of many models as the Japanese auto industry remains disrupted by the March 11 earthquake and its aftermath. "We've gone from 60 (Priuses) in stock to 16" over the last two months, says Buzz Rodland at Rodland Toyota in Everett, Wash. A dozen are coming, "but we are told they are going to dwindle" quickly after that. Indicating the shortages may not be brief, Honda has told dealers it's not taking orders for any vehicles made in Japan in May. March and April orders already were delayed. Topsham, Maine, dealer Adam Lee says the only Priuses left that dealers can get their hands on in New England tend to be the fully equipped, costlier models, which could have the effect of pushing up prices even more if buyers get past their usual resistance to the higher-price versions. In what now seems like a stroke of genius, he says, the family's Toyota store bought 15 used Priuses at a wholesale auction, then went back and got 15 more — at higher prices. Wholesale prices on used Priuses are up about $1,500 just in the last month, he says. Toyota, Honda and others say they hope to resume production this week, but that could be unrealistic. "From all the things we're gathering, including memos from Japanese companies … the potential impact of the tragedy is a bigger deal" than they are portraying, says Jesse Toprak, analyst at auto researcher TrueCar.com. 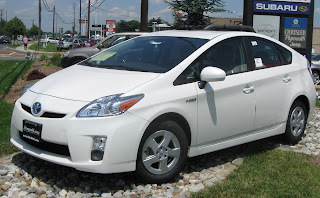 Prices of Prius and Fit, both iconic for fuel-conscious buyers and both made only in Japan, inched up immediately after the disaster, according to daily data tracked by TrueCar.com. The average price paid for a Prius in the U.S. rose $135, or 0.5%, the first four days after the March 11 quake, to $25,629. Fit was up $21, or 0.1%, to an average $17,246. Other high-mileage cars made for the U.S. market only in Japan include the Toyota Yaris; Honda Insight, CR-Z and Civic hybrids; Mazda3; and Nissan Leaf electric car. People seeking to quit leases early and get into new cars before there's a shortage could be in luck. Brian Allan, general manager at Galpin dealerships in Los Angeles, says many dealers want off-lease cars for used car lots because the recession cut the number of trade-ins. When the leases were written in the worst of the recession, wary lenders assigned artificially low after-lease values. Now the cars are worth more than forecast, giving the lease holder equity toward a new car and the dealer a potentially profitable used car. Allan says he's telling lease customers, "'You're in a position to trade out early, skip your last four payments and get into a new car.'"